Sparkline Welders is a professionally managed fast growing company with impressive track record for the manufacturing of a complete range of welding solutions & Machinery. The provided range of product is fabricated utilizing the finest quality raw materials and upgraded technology in compliance with the set business values. Our provided products are highly acclaimed and acknowledged for their varied features such as fine finish, superb quality, reliability, durability, low maintenance, reliable performance, easy to use, robustness and low power consumption. Our team members work in close synchronization with the customers in order to understand and fulfill their precise needs and demands. The provided products are also checked on well-defined quality parameters utilizing latest testing tools and machines by our expert quality auditors to ensure their precision. 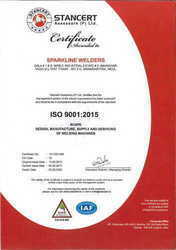 Sparkline Welders is ISO 9001:2015 certified Company, having own factory premises, having a full-fledged set up required to facilitate manufacturing of a complete range of welding machines. The Company is providing best welding solutions & Machines with stringent quality controls, best required features and prompt after sales services and support. 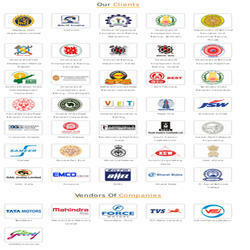 The Company has fully dedicated team of well qualified technical staff with updated knowledge of Welding Technology. The company is growing with technical support of Mr. M. S. Khatri, a well known technical expert in welding technology having experience of more then 40 years in the field. Manufacturing and Trading of Welding Machines. To enhance the productivity by providing constant innovation & efficient solutions there by contributing to the growth of the Eco System. 20 years from now SPARKLINE, will be the most preferred company in the WELDING AND CUTTING industry, with a large number of satisfied customer base across the Globe. Sparkline, will be having a world-class manufacturing set up and offices across India equipped with latest machinery and Infrastructures and software-based systems to handle a large distribution networks in more than 10 countries across the globe. SPARKLINE will be well known for its Quality Products and prompt after sales support and services. At our technologically superior infrastructural unit, we follow all global quality standards at every step of our manufacturing process, which lead to an unmatched quality range at fast production rate. We have developed advanced quality testing unit, wherein all the finished products are strictly examined on different parameters in order to eliminate all kinds of defects and flaws. Implementing ISO 9001:2015 Quality Management System. Training motivating and involving all the employees in achieving excellence in product quality. Upgrading the technology appropriate to the changing needs of the customer.